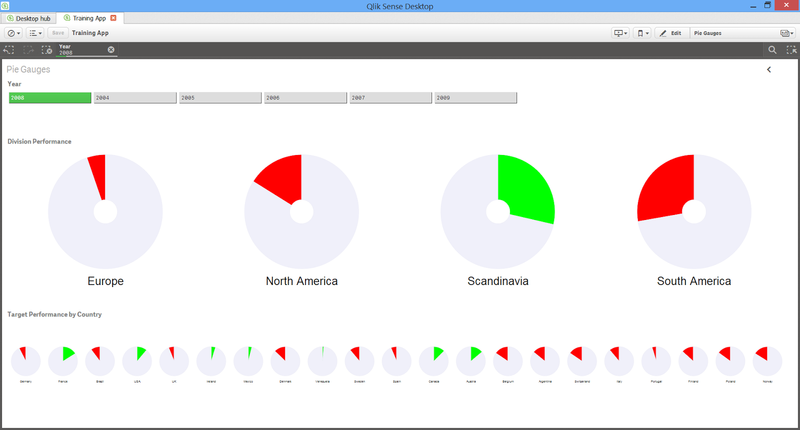 Qlik Sense is all extensions. Even the out of box objects are extensions. It also comes with some samples of additional Extensions. After installing Qlik Sense Desktop, have a look in %userprofile%\Documents\Qlik\Examples\Extensions. You will find several sub-folders, each containing one extension. If you have experience with QlikView 10/11 extension objects (or have read my blog entries on how to create extensions) then you will see immediately that there is a different way of creating extensions in Qlik Sense. - a .QEXT file which contains the JSON description of the extension that will be used within the desktop client. Additional files can be added as required. If you copy one of the extension folders into %userprofile%\Documents\Qlik\Sense\Extensions and restart the Qlik Sense Desktop (F5 may be enough) then the extension should appear. You can also simply create your own sub-folder and create the .QEXT and .JS files and they will be picked up. However, it is easier to use the Workbench to create your extension from a template. To run the Workbench, first make sure that Qlik Sense Desktop is running (it provides the web service for this) and then connect to http://localhost:4848/workbencheditor. There is no documentation for the extensions in the default help for Qlik Sense, but you may be able to access the beta documentation at: http://betahelp.qlik.com/0.95/en-US/online/index.html. I am happy for anyone to grab the code for this from my github repository. Just grab the whole RedmondPieGauge folder and drop it into your %userprofile%\Documents\Qlik\Sense\Extensions folder and restart the Qlik Sense Desktop. You need to specify one dimension and then two expressions - one for Actuals and one for Target. Each of the objects - including the text labels - are clickable to make selections exactly as if they were a Qlik Sense object. This also implements a slider in the properties to allow you set a doughnut size. Anyone who knows me will know that this was definitely an academic exercise - I hate doughnut charts!